Mix plum sauce, water, vinegar, cornstarch and mustard. Spray wok or 12-inch skillet with cooking spray; heat over high heat. Add chicken; stir-fry about 2 minutes or until no longer pink in center. Add carrot and onions; stir-fry 1 minute. Stir in plum sauce mixture. Heat to boiling, stirring constantly. Boil and stir 1 minute. 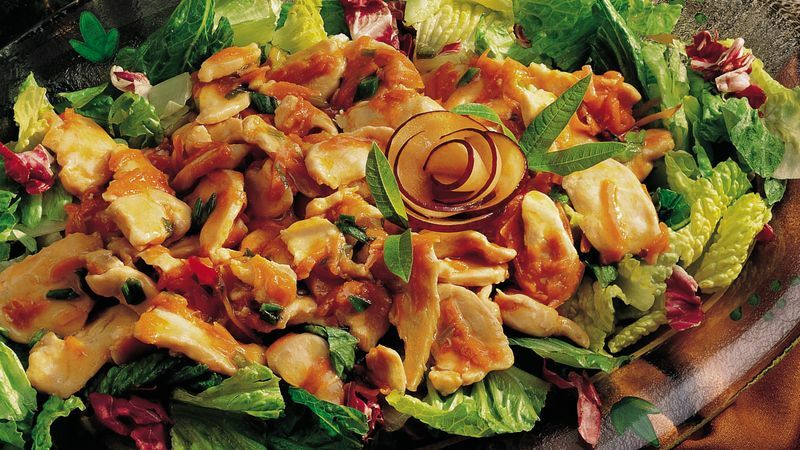 Remove chicken mixture from wok. Refrigerate about 30 minutes until cool. Serve over salad mix. Keep it simple. Purchase spring rolls from your favorite local Asian takeout, and end the meal with a purchased lemon sorbet and fortune cookies. For a simple garnish, cut fresh plums into small wedges and arrange as you like on a platter or on individual salad plates.